The meaning of the pineapple spans centuries, recognized as a symbol of hospitality, friendship, and the universal party fruit throughout numerous cultures. The pineapple traditionally symbolizes "welcome" and hospitality, as well as friendship, generosity, and other forms of social warmth and graciousness. It is no wonder we had to create our 100% beeswax Pineapple Candles to share will all. 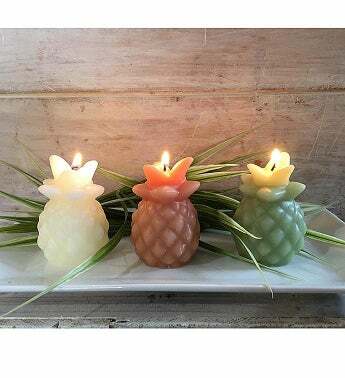 Our Pineapple Beeswax Candles come in a set of 3 and measure 3 inches tall x 2 inches wide. They burn approximately 15 hours each. The are the perfect hostess gift, wedding favor or just to add to your home decor as an accent. The meaning of the pineapple spans centuries, recognized as a symbol of hospitality, friendship, and the universal party fruit throughout numerous cultures.